The Eastern Cape is one of the most beautiful and interesting regions in South Africa. It enjoys a great climate with mild temperatures along the coast , making it ideal for diverse outdoor attractions. The Tsitsikamma Falls Adventure Park forms part of the Garden Route and is the centre of adventure tourism. It is home to the highest commercial bungee jump in the world (216m), the highest narrow gauge bridge in the world, South Africa’s first national marine park (the Tsitsikamma National Park), and the country’s first tree-top canopy tour. Hiking trails include the world famous Otter Trail (48km), the Tsitsikamma Trail (72km), and the luxurious Dolphin Trail. Tsitsikamma National Park is a multi-dimensional destination with dramatic coastal scenery, reefs, rivers, lush forest and delicate Fynbos. A hiking and water sports paradise, this region forms the top section of the magnificent Garden Route National Park. There are many hiking trails of varying lengths and nature walks in this region, the most famous of them being the Otter Trail, one of the best in the world. For those who prefer not to rough it there is a “slack packing” route, the Dolphin Trail, which is fully inclusive and includes portage.- "Click on Pic"
Addo Elephant National Park is a diverse wildlife conservation park situated close to Port Elizabeth in South Africa and is one of the country's 19 national parks. 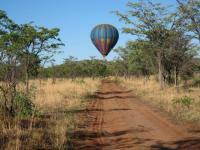 It currently ranks third in size after Kruger National Park and the Kgalagadi Transfrontier Park. - "Click on Pic"